The 40″ L7 offers Full HD 1080p image quality and is ready to display Full HD 3D content. The L7 Smart TV series with its super slim design brings more content and connectivity to your home. 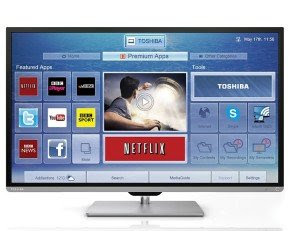 The L7 series includes built-in Freeview HD and internet TV including YouTube, BBC iPlayer and Facebook as well as a range of other online content from Netflix, Twitter, Livesport.TV and more via Toshiba Smart TV services, all easily accessed via built-in Wi-Fi. Bring the magic of 3D from the cinema to your living room with sharp, vivid and lifelike images with incredible depth for an immersive viewing experience whether you’re enjoying movies, sports or the latest documentaries in 3D. With 2 pairs of lightweight, comfortable Active3D glasses included in the box, you can enjoy the immersive viewing experience of 3D at home. 2D to 3D conversion and 3D depth control allow you to enjoy all your existing content in 3D. The L7 series TVs support Full High Definition 1080p resolution content. Offering outstanding picture quality and lifelike image reproduction, your films and programmes will appear crisper and more detailed. Ideal for sports, movie and documentary enthusiasts who want to experience the most from their entertainment, this Full HD TV will be able to display HD images from any HD source. The L7 series also includes an advanced backlighting system that guarantees new levels of picture clarity by constantly adapting to the images on the screen. Colours are made more vibrant and contrast between light and dark is more pronounced, providing dramatically improved performance, whilst overall energy consumption and the thickness of the TV is also reduced. Built-in Wi-Fi allows you to wirelessly connect your TV to the internet, with DLNA technology giving you access to content stored on compatible laptops or other digital devices over your home network. DLNA allows you to stream multimedia content including music, video and images to be enjoyed on your TV. Print with ease and efficiency with the compact, reliable DellTM B1160 Laser Printer. It offers value for your home or small office. The compact Dell B1160 is designed to fit well in homes and small offices alike. Count on high-quality printouts, reliable performance and high-speed printing. Print effortlessly with easy-to-access control buttons; experience streamline operation with a fuser unit designed to last the life of the printer and only one toner cartridge to replace. At just 13″(33.1cm) wide,8.4″(21.5cm) deep and 7″(17.8cm) tall, the Dell B1160 is very compact. It’s ideal for homes and small offices where space is a premium. Be easy on your budget. The Dell B1160 is not only affordable, but it can deliver a low printing cost per page. Effortlessly start or cancel printing jobs with easy-to-access control buttons. Minimize upkeep with just one toner cartridge that prints up to 1500 pages. The fuser unit is designed to last the life of the printer. Enjoy high-speed printing — up to 20 ppm (A4). Experience razor-sharp images and graphics as well as clean, precise text with up to 1200 dpi Image Quality. Enjoy a high duty cycle of up to 10,000 pages per month and a convenient high-input 150-sheet paper tray. Print large files quickly with a standard memory of 8MB RAM. Feel good knowing the B1160 is RoHS and ENERGY STAR 1.2 qualified . Return empty toner cartridges to Dell and participate in our recycling programs. Visit Dell.com/recycle. When it comes to speakers the Xenta 303 2.1 channel Subwoofer speaker System is hard to beat for those wanting to play music, go gaming or watch movies from any device with a 3.5mm jack input (which is most audio and movie devices on the market). The 303 produce incredibly good sound for a budget system, you would expect this quality of sound from speakers at three times the cost. They produce real Hi-Fi quality output from 2 Satellite speakers and a Subwoofer. The Xenta 303 2.1 channel Subwoofer speaker System is a full bass reflex system with a built in powerful amplifier which will fill most rooms with sound. This means if you have an IPod, MP3 or portable player audio it is boosted by the powerful 5 watt Satellite Speakers and the 10 Watt Subwoofer. Designed for professionals, Gamers, Music and Movie Enthusiasts everywhere the Xenta 303 2.1 channel Subwoofer speaker System is an amazing budget audio system. It is aimed at a price category which makes it accessible and affordable to all. 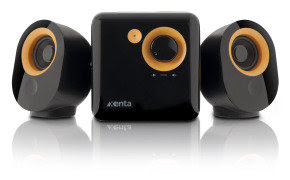 The Xenta 303 System offers exceptional value and at the advertised price makes them a “Must have Purchase”. Looking closely at the Xenta 303 Speakers you can immediately see many features which are only on more expensive and advanced speaker sets. For instance they feature a powerful built-in amplifier, Active subwoofer, 2+1 arrangement, compact design, magnetically shielded, LED indicator, Large satellite Separation Degree, Wide Frequency Spectrum, Low signal to noise ratio, Master volume control, Sound Balance Technology, Compact footprint and easy installation. The 2.1 channel separation is very clear on these speakers, The Xenta 303 System represents a truly creative approach to audio on a budget and comes highly recommended. Patriot Memory’s Viper 3 Series memory kits are designed with true performance in mind. 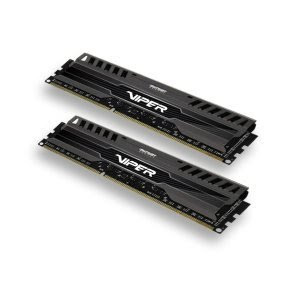 Tested and compatible with Intel’sÂ® DDR3 compatible processors and chipsets, The Viper 3 series provides the best performance and stability for the most demanding computer environments. The Viper 3 series utilizes a custom designed high performance heat shield for superior heat dissipation to ensure rock solid performance even when using the most taxing applications. Built from the highest quality Build of Materials, Patriot Memory’s Viper 3 Series memory kits are hand tested and validated for system compatibility. Hand tested for quality assurance, the Viper 3 series is backed by a lifetime manufacturer warranty. If you have any questions about the latest deals at ebuyer, or would like to know anything else about about the latest deals at ebuyer, please get in touch and feel free to tell us! This entry was posted in Discounts, Special offers and tagged Computers, Electronics, Music, Office supplies, TV by admin. Bookmark the permalink.